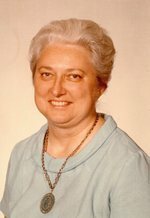 Mildred H. Weiss passed away on Monday, September 10, 2018. She was 90. Mildred was the wife of the late Paul M. Weiss and the daughter of the late Herbert and Lillie Holweger. She was a graduate of Hatboro High School, Class of 1946 and earned letter awards in music and in service. Mildred was a former member of the Hatboro Baptist Church where she taught Sunday school and sang in the choir. She had been employed with Hatboro Federal Savings and Loan for over 15 years as a bookkeeper and secretary. She was also employed for 16 years with Tudor Technologies, Inc. of Horsham as a bookkeeper. Mildred enjoyed traveling, including visiting US National Parks, boat cruises on the Great Lakes and motor car trips on the east coast. She enjoyed photography, cross stitching, and oil painting. She volunteered at the Warminster Library and at Christ Home Retirement Community. Mildred is survived by her 2 brothers, Herbert and Walter. She is also survived by various nieces and nephews. Mildred was preceded in death by her sister’s Dorothy Craig, Anna Diener and her brother R. Edward Holwger. Mildred’s Funeral Service will be held at 11:00 am Tuesday September 18, 2018 at the Shelly Funeral Home, 1460 Easton Road, Warrington where the family will receive friends after 10:00 am until the time of service.